As department stores bear the brunt of retail industry shifts, high-fashion player Nordstrom is among the first and most efficient in blending hallmark stores with digital capabilities. The company now earns 26% of its sales online, while other industry players only earn about 18%. As part of our Future of Retail 2018 Report, PSFK put together a case study on how the retailer is effectively building and diversifying its retail portfolio to adapt to the expectations of a new generation of consumer. Our finding are underpinned with the trends from our report. At Nordstrom, digital has driven improvements in personalized experiences and efficient fulfillment, shoring up overall business growth and impacting brick-and-mortar strategy—driving the company to invest heavily in building a foundation of cross-channel integrations, and offering digitally-enhanced experiences that rely less on store infrastructure. 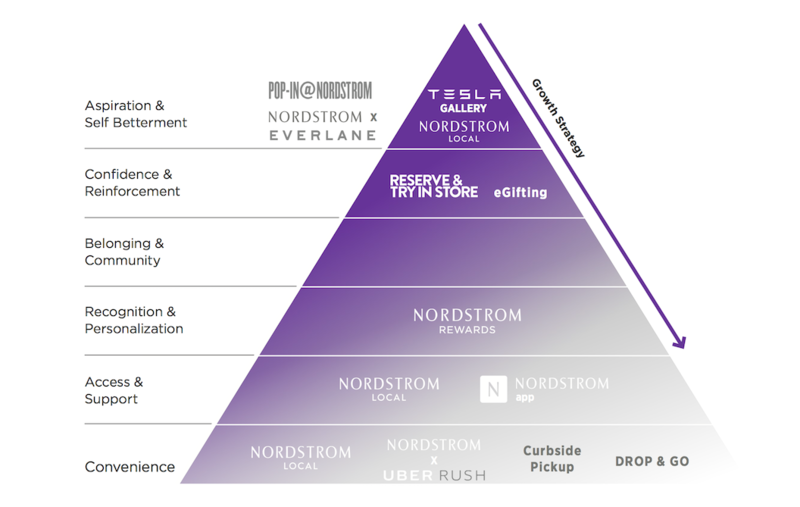 What are Nordstrom’s core drivers of retail success? These Nordstrom services inspire greater confidence and supply reinforcement to help shoppers make decisions. For example, Reserve & Try In Store lets customers reserve products online to try on in person; 80% of shoppers who tried the service have used it multiple times. Better recognition and personalization make shoppers feel welcome and at home when they enter the store. To that end, the expanded Nordstrom Rewards loyalty program tracks shopper behavior and offers perks across in-store and online channels. Meanwhile, improved access and support make brick-and-mortar locations a more important touchpoint in the shopper’s purchase path, like Nordstrom Local, which serves as a physical hub for placing online orders and making returns. Nordstrom Local sources inventory from a network of stores and delivers to customers the same day, while 24/7 Curbside Pickup at store locations for online orders makes pick-up easier for shoppers during the holiday season. In addition, the Nordstrom x UberRush partnership offers same-day delivery in select cities. Ultimately what this means is a greatly improved level of convenience across both online and offline retail. The Future of Retail 2018 outlines how companies can transform their stores into experience centers that extend their supply chain and digital commerce platforms, creating mutual value with a focus on shopper experience. Members can download the report today or all readers can immerse themselves in the findings at our retail conference on Jan. 17, 2018.